Frank Kassela quickly turns over his seventh card, and while he can't beat Kessler's pair of sevens, he does have an 8-low. 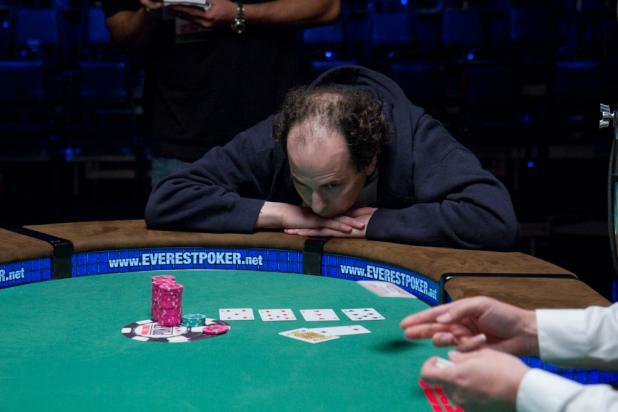 Allen Kessler realizes that he is guaranteed to survive with at least a split pot, but he also has a chance to scoop the pot with a 7-low if his last card is an ace, a six, or a four. 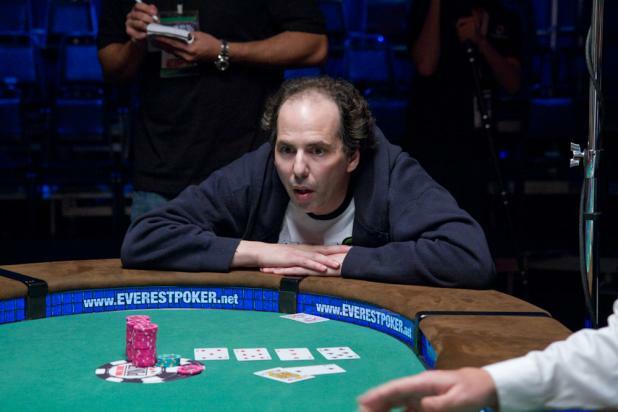 With all his chips committed to the pot and his seventh card being dealt, Allen "Chainsaw" Kessler is in the lead for the high hand while Frank Kassela is in the lead for the low. It's likely to be a split pot, but Kessler -- known for being a pessimist -- looks like he expects to be eliminated. Even though she is trailing in the chip counts with three players left in Event #15 ($10,000 Seven Card Stud Hi-Lo), Jennifer Harman is optimistic and tells her opponents that she isn't going down without a fight. 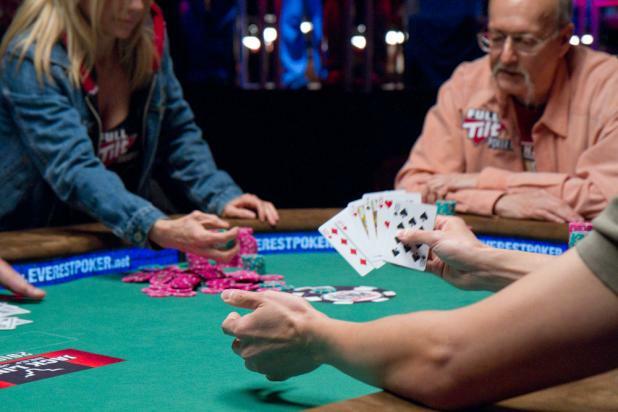 Unfortunately, she starts her final hand drawing to a 6-low in her first four cards but never improves, and Allen Kessler pairs up on seventh street to scoop the pot. Harman is eliminated in third place, tying Joanne "J.J." Liu's third-place finish in Event #9 ($1,500 Pot-Limit Hold'em) -- the only two women to make final tables so far in the 2010 WSOP. Frank Kassela is a successful businessman from Tennessee who recently moved to Las Vegas to spend more time playing poker. 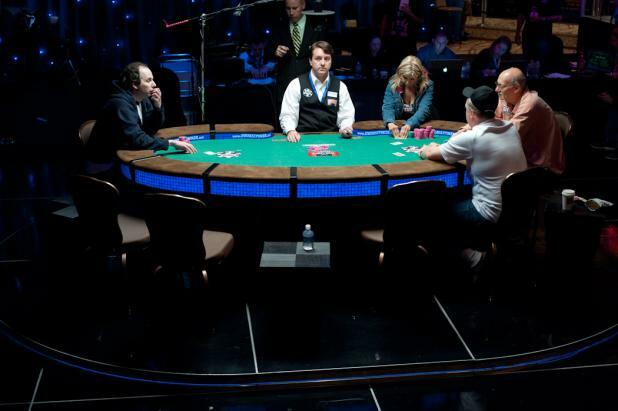 This is the eighth WSOP cash of Kassela's career, and his second WSOP final table. Coming into this event, he had already crossed the million-dollar mark in career tournament earnings. 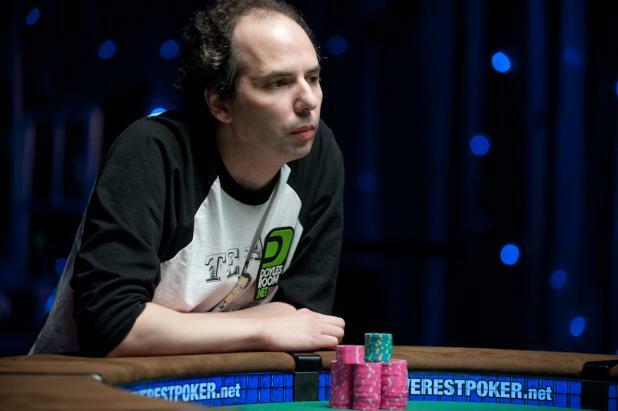 Allen Kessler is known throughout the tournament circuit as being the quintessential grinder, a tight player whose primary goal is to finish in the money. (He received the nickname "Chainsaw" ironically, and it stuck.) But all those min-cashes add up, and Kessler has earned more than $1.5 million in live tournaments coming into the final table of Event #15 ($10,000 Seven Card Stud Hi-Lo). 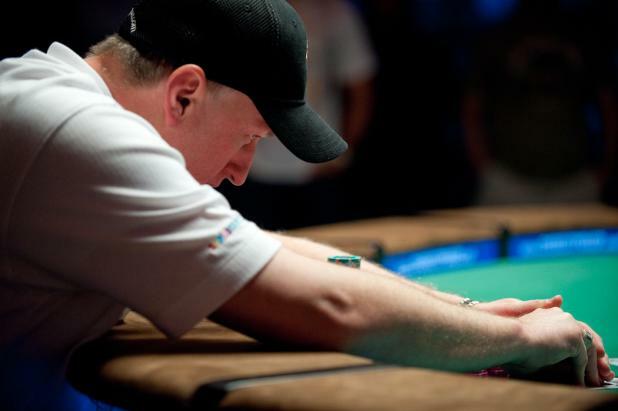 This is Kessler's third WSOP final table, and he is still looking for his first bracelet. 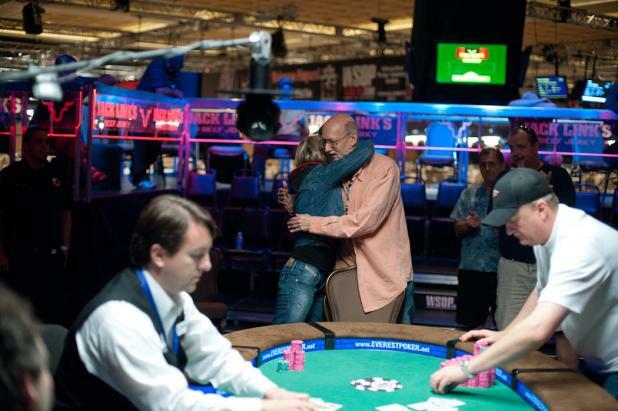 A Hug That Says "Congratudolences"
Steve Zolotow receives a hug from Jennifer Harman after being eliminated in fourth place in Event #15 ($10,000 Seven Card Stud Hi-Lo). The only word that can describe this is "congratudolences," a term coined by poker commentator Joe Stapleton that combines congratulations for a deep run with condolences for not getting the win. After losing a big pot to Allen Kessler, Steve Zolotow (standing) is all in on third street against Frank Kassela (right) with a split pair of queens against Kassela's split nines. But Kassela makes trip nines on sixth street, while Zolotow still has nothing but the pair of queens. When the final cards are dealt, Kassela quickly reveals his seventh card, which doesn't improve his hand. Zolotow needs one of the last two queens to stay alive, and he asks if someone else will turn over his final card. Kassela agrees, and turns over a jack -- not good enough. Zolotow is eliminated in fourth place, and Kassela now has a big chip lead with three players left. Allen "Chainsaw" Kessler is all alone on the left side of the table, while Jennifer Harman, Steve Zolotow, and Frank Kassela anchor the right in Event #15 ($10,000 Seven Card Stud Hi-Lo). John Juanda is eliminated in fifth place when his two pair run into Frank Kassela's set of aces. 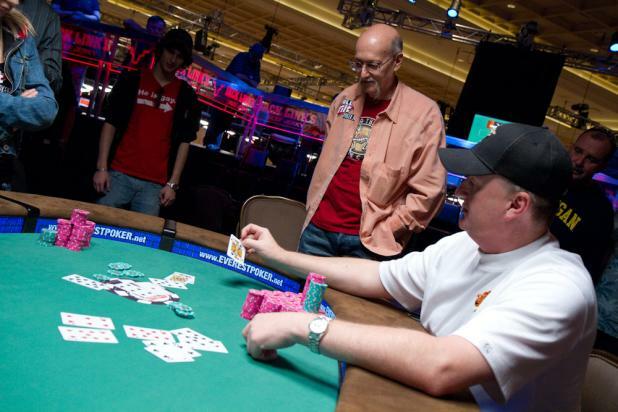 This was Juanda's second final table of the 2010 WSOP (he finished fourth in the $50,000 Poker Player's Championship), and he earned enough POY points to move into a tie for sixth in the WSOP Player of the Year race. 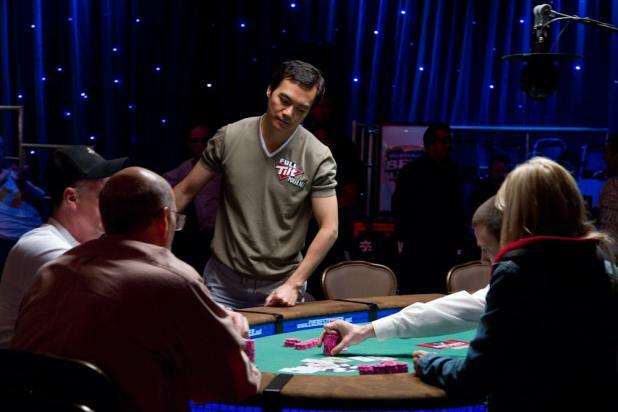 John Juanda takes one last look at his hand after losing a pot to Jennifer Harman, who stacks chips across the table. Harman had a surprising ace-high flush (three spades in the hole) and a 7-6 low, while Juanda had two pair and no low. Harman scooped the entire pot to take a large portion of Juanda's chips.